Return to Spotted an Alpine? Anyone on here?? I was thinking about stopping and seeing if he wanted to sell it... but I have my hands full with the A610 right now!! looks like an atmo with some damage to the rear spoiler panel. knock on the door vince and find out more. Mr Blueg33, If you are in the area and wanted a peek.... its just off Junction 2 M42, B4101, Dagnell End Road. The large house in the corner... Blink and you will miss it.. 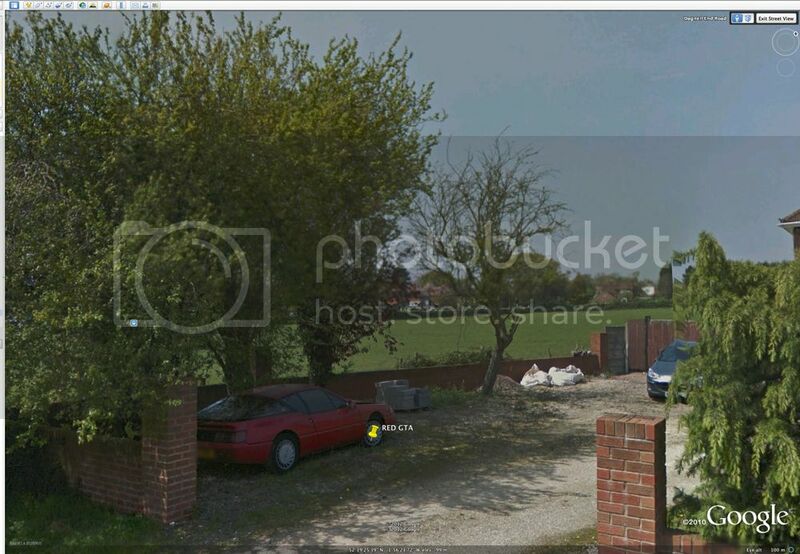 I think he maybe a car collector, as Google earth shows more cars in the back yard.. Up to you if you want to ask?? as I said I have my hands full with my A610 for now.. I may call in next time and "Plug the club!!" Thought I would update you on this one, went over and left a message for the owner to call me, yes it is an atmo with a private reg . Finally got a call and going over to have a look to buy this weekend. Add another to the collection. Well done. No one was in when I knocked on the door, I didnt leave a note though as I thought buying the whole car was overkill to obtain a rear light! And I nearly spat my tea in his face when he said he would not take no less than £1950 for it. So the highest value bits are gone. If you do get it and are breaking it, there are a couple of parts I am after. Formed originally for fans of the V6 Renault Alpines including the Alpine GTA V6 GT, GTA V6 Turbo, GTA Le Mans and A610. Owners of the Alpine A110, Alpine A310, Renault 5 Alpine, 5 Turbo 1 & 2, Spider, Clio V6 and all Turbo & Renaultsport vehicles built at the former Alpine factory in Dieppe are welcome and will find photographs, literature and information relating to their cars.